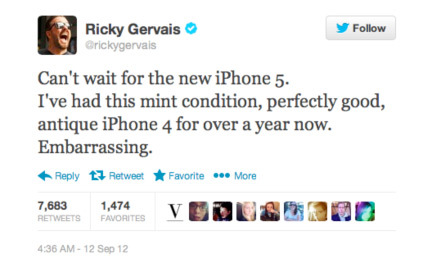 We love Ricky Gervais’ thoughts on unnecessary upgrades. From hyper consumption to collaborative consumption, welcome to our new world marked by trust between strangers, access over ownership, and experience over stuff. Good-bye wasteful ways, hello resourcefulness! Secondhand shopping reduces the impact on our environment and our wallets. Check cute, stylish Jessi Arrington, who gets all her clothing second hand. How many T-shirts do you own? One? Five? Twenty? 2,700 litres of water go to making one t-shirt. That’s enough for one person to drink for 900 days! Got 5 minutes? Hear how less stuff = more freedom and time! Need a five minute break? Ba da da da daaaa. We still love this 2012 chart topping op shopping tune, so today, we’re recycling it! Crank this for a Buy Nothing New Month theme song. When We Throw Something ‘Away’, where is ‘away’? Have you been to pinterest and typed in ‘upcycled’ or even googled it? What’s in your home or wardrobe you can remake into something else? For you or someone else? Buying second hand at charities like Brotherhood of St Laurence, doesn’t just extend the life of existing goods, but supports their amazing work in our communities.